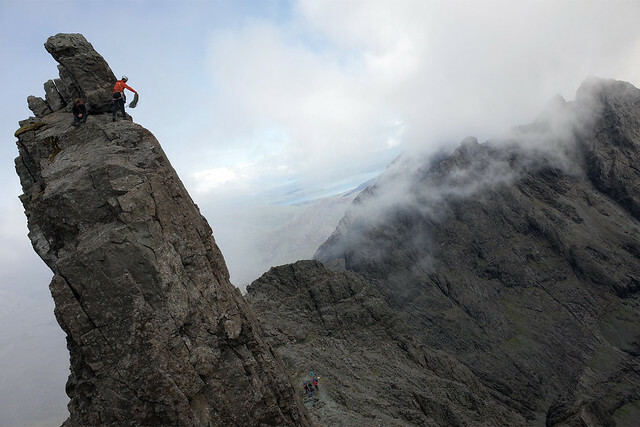 The first week in June I climbed all the Cuillin ridge munros in a guided group with Paddy McGuire. 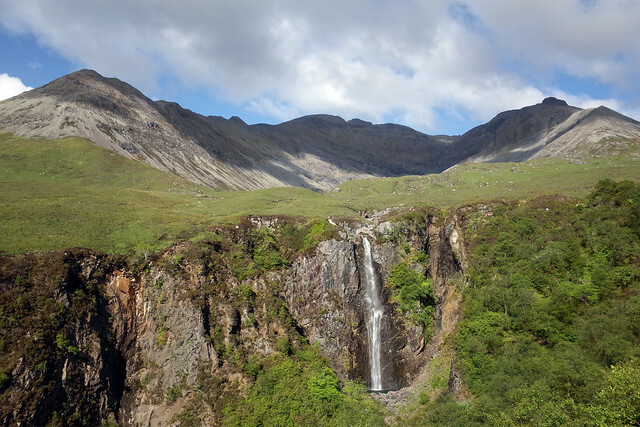 I travelled up to Skye with my Dad who, while not joining me on the mountain, enjoyed some gentler walks nearer sea level and without whose logistical support this trip could not have happened. Thanks Dad! After a very long drive up Saturday from the West Midlands, Sunday was spent resting in Carbost, scrutinising maps and thinking about the challenge ahead. Arriving on Saturday evening, Dad and I had been greeted with clear skies a great view of the ridge. But now, just hours later, the weather had turned wet and heavily overcast and I was not optimistic about conditions for the coming week. Despite a strong start to my munro bagging campaign in 2014 the fear also still haunted me of a return of my knee trouble. By Sunday evening, the anxiety that had gripped me for several days in the run up to the trip had not abated. At last, the big day arrived. Dad dropped me off at the end of the Glen Brittle road where I met the rest of the group. Our objectives were the three southernmost of the ridge munros. I knew our guide, Richard ‘Paddy’ McGuire after climbing Bla Bheinn with him in 2012 and was introduced to the other members of the group: four friends Alistair, Simon, Bruce and Dave who had convened on Skye from as far away as Norfolk (their “Norfolk Mountain Rescue” meme would run throughout the week!) plus Mick who had travelled across to Skye from Fife. We set off into the cold and a drizzle that seemed to get progressively heavier at points during the day. On the walk in from Glen Brittle we were buzzed by a civilian helicopter. I wondered who on earth would be out flying in these conditions - not a day for a pleasure flight. (Turned out to was Bear Grylls filming - we all joked that he was probably ensconced in a comfortable hotel somewhere on the island). The weather remained poor the entire day though there was thankfully no wind and we reached all three summits. In the wet the going was psychologically hard though. Paddy reminded us of the words to a Presbyterian hymn that seemed to fit the conditions, “Life is hard, life is earnest - and the grave is our reward.” Cheerful lot those Presbyterians. To reach Sgurr nan Eag we dropped out packs near Caisteal a Garbh choire and then grabbed Eag on an out and back. Atop Eag I took a little tipple from my hip flask to celebrate my first ridge munro. Paddy seemed unimpressed though and I took as sage advice his caution that on the mountain, a drink - however small - is never a smart idea. The flask stayed in my pack the rest of the week. 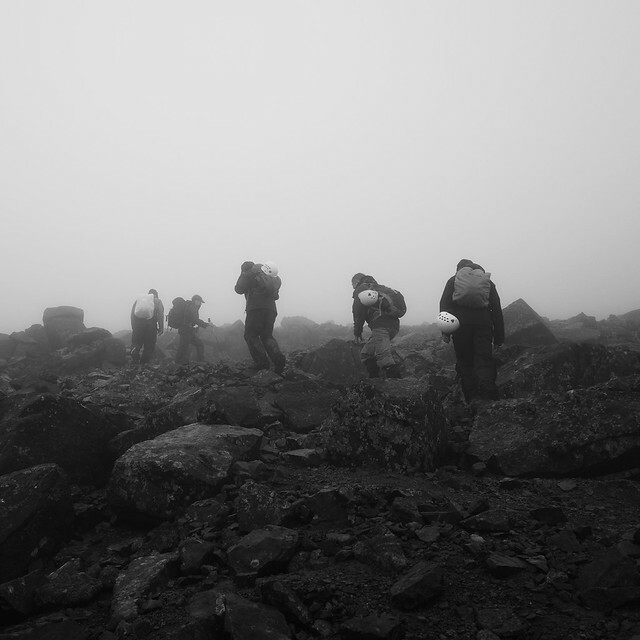 The scramble up to Sgurr Dubh Mor was hard and certainly felt exposed, despite the poor visibility. This was our first taste of Cuillin gabbro which scoured our hands like sandpaper even while wet. We seemed to have the mountains to ourselves but did meet one other group near Sgurr Dubh Mor. At Sgurr Alasdair I spotted a seagull soaring overhead, the only sign of wildlife all day, apart from a couple of deer spied not far from the Glen Brittle road. Our descent via the Great Stone Chute was hard going. At times the mountain seemed to slip from under us. Passing through Coire Lagan we couldn’t really appreciate what a serene spot it must be. Earlier in the day, circling round Corrie a Ghrunnda I had thought to myself what a wonderful location for a picnic and a wild swim. By day’s end I was in good spirits despite the lousy weather. The rain and mist meant my camera had stayed in its case nearly the whole day so my recollections of day one are all written rather than visual. Thankfully my waterproofs held up well and I was able to keep dry feet all day. 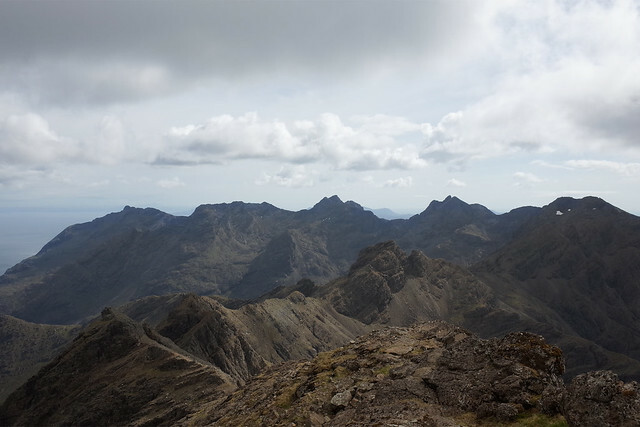 Three munros bagged and a taste of the Cuillin. Dark, mysterious peaks that don’t give themselves up easily. Setting off from the Glen Brittle youth hostel the slog up to Banachdich was technically straightforward but hard going for tired legs. This morning Mick didn’t join us. The jarring descent of the Great Stone Chute had caused him knee trouble and he had decided to rest. At the start of the day the weather was still very cloudy with on and off drizzle - but slightly warmer than Monday. One of those days where it’s impossible to regulate temperature or get the clothing balance right. Every time I removed a waterproof layer seemed to be cue for the rain to start up again! We dropped our packs for the last leg to Banachdich, Paddy quipping that this was the one Skye munro you could reach with your hands in your pockets! Continuing on to Greadaidh we crossed Thormaid (Norman’s Peak) - a pleasing and airy top. The scrambling today felt a little harder and more technical than Monday and we reached for the rope at one stage to navigate a tricky down climb. 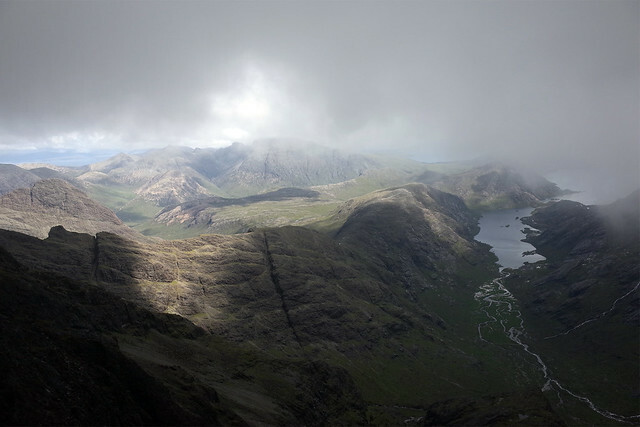 In the afternoon the weather started to clear slightly and we enjoyed mesmerising views of Loch Coruisk. I noticed the sound of a military fast jet at one stage but caught no sight of it because of the cloud. Earlier in the day, we had seen a raven soaring on the updraft through Eag Dubh, an impressive cleft in the mountain where once there would have been a pillar of basalt. After ticking off Mhadaidh we descended via Coire An Dorus in steadily improving weather. The sun came out and we crossed lush green grass, passed bubbling streams and waterfalls and caught sight of the Small Isles on the horizon. Technically it had been a harder day than the first but my spirits were really up. Six munros (and pretty hard ones at that) in two days exceeded all my previous mountain achievements and so far, my hill fitness was holding up really well. We met at 9 at the Sligachan mountain rescue post and headed directly for Coire a Bhasteir. We were still without Mick who had gone to climb Bla Bheinn alone today, wanting to enjoy the tremendous views of the ridge that the clear weather promised. We set quite a fast pace as indications were that the weather might deteriorate in the afternoon with some forecasts mentioning possible lightening strikes. I hoped not as that would certainly put paid to our plans for the day. It seemed like a long walk into the corrie but on reaching the bealach we enjoyed our first real views of the week, with terrific vistas across the whole ridge. I was awe struck. We tackled Am Basteir first, with Paddy lowering us on the rope at one section of its East ridge. From its summit we could see across to Sgurr a Fionn Choire. We returned to the bealach, navigating the tricky section without the rope we had needed on the outward leg and enjoyed our lunch in the most spectacular scenery imaginable. Heading for Sgurr nan Gillean we passed another guide with his client almost at the final stage of their ridge traverse. 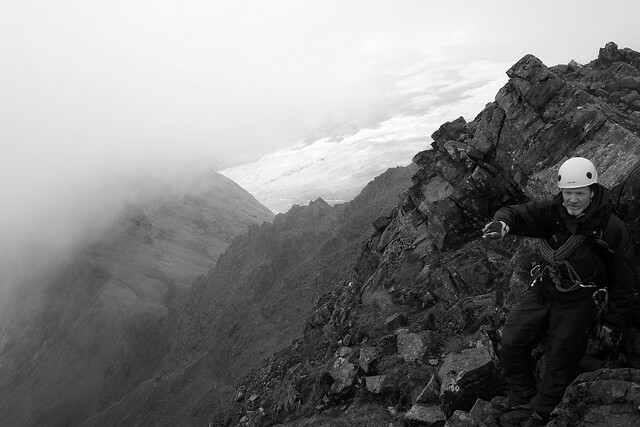 We reached the summit via the west ridge, climbing on the rope to the missing gendarme. At the base of this climb we met a fairly elderly walker (mid 70s perhaps) who had walked up alone through the corrie and who tried to persuade us to take him up to the top with us. Without a helmet or harness for him though there was nothing we could do and he had to turn back. We were all impressed by his enthusiasm and fortitude to get as far as he had done. Standing in warm sunshine on the summit of Sgurr nan Gillean was without doubt the highlight of the whole week for me. The views in all directions were simply incredible. We could see across to Bla Bheinn and beyond to Knoydart, north to Torridon, west to the Islands and the entire ridge stretching southwards from this lofty vantage point. We watched two RAF Tornado jets blast beneath Bla Bheinn almost touching the surface of Loch na Creitheach and out to sea. The aircraft were so low it was a truly surreal experience to be standing thousands of feet above them as they zoomed past. Descending the west ridge a trio of lads from Southampton abseiled down before us. Rather than abseil, Paddy controlled our descents for us. Not really a climber I still found it a psychological hurdle to just lean back over the edge and trust the rope. Once underway though it was great fun. The rock face was quite craggy and Paddy assured us that after this, descending the In Pinn would be a doddle. We had to summon all our strength for the last munro of the day and ninth of the week so far, Bruach na Frithe. We dropped below the north face of Am Basteir and at the bealach na Lice had great views of the Tooth. Reaching the summit saw us cross screes as well as a surprisingly large patch of snow. Having almost cooked in my warm layers on top of the first two summits I was chilly standing on top of Bruach na Frithe after leaving my extra layers with my pack at the bealach. The wind was starting to whip up a little and after taking in the view we didn’t hang about. From the summit of Bruach na Frithe we could already see in the distance the weather coming in from the east which had been forecast. I had a good descent and kept turning back to admire that iconic view. I felt strong in my legs and my heart. Knowing the weather was turning I was looking forward to a day off after three very full days. Thursday was spent resting and gift shopping in Portree. Friday morning we assembled once again in Glen Brittle, rejoined by Mick who had had a great day on Bla Bheinn on Wednesday. 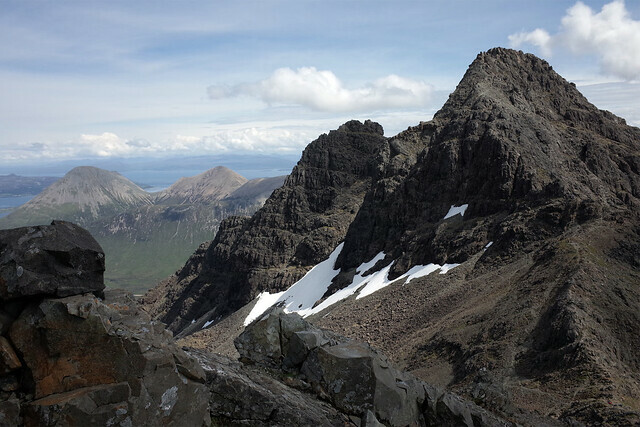 Today was the culmination of our progress through the Cuillin ridge munros. The 70th anniversary of D-Day too. Climbing up to the ridge again the thought crossed my mind how fortunate I am to live in a generation which by and large does not know war. We gained the ridge via the left hand edge of the An Stac screes. As sunlight broke through the mist we donned our harnesses and helmets and dropped our packs ready for the scramble up to Mhic Choinnich. The route was good fun though there was sadly not much to see from the top as mist closed in again. On our descent back to the belach we encountered again the chap from Wednesday who had wanted to join us up to Gillean. Whilst admiring the guy’s determination, it was a bit worrying to learn that he thought he was on his way up Sgurr Dearg when in fact he was half way up Mhic Choinnich. He followed us all the way back to the bealach and then up the slabs to the In Pinn where, amazingly, he blagged a harness and helmet from another guide who still had a rope on the In Pinn and who kindly belayed him up the west face. Credit to the guy. I hope I have the same pluck when I hit my 70s. Our group of six split into 2 groups of three for the In Pinn. The ascent of the East ridge was pretty straightforward. The exposure was considerable but I felt confident throughout - we already had a lot under our belt from the first few days. At the top, the obsessive in me desperately wanted to climb atop the bolster stone - one day I will. But on this occasion I had to settle for placing a palm halfway up it, before beginning the descent which Paddy controlled. I enjoyed it immensely and on unclipping from the rope at the base of the west face I was filled with an incredible adrenaline rush. I wanted to do it again - I still do! Waiting for the rest of the group to cross the In Pinn I got some amazing photos of mist swirling in the corrie and other groups on the climb with views towards Alasdair behind. The sun broke out and we had a warm, pleasant descent with great views to the islands, magical waterfalls and, on the lower slopes, spring lambs leaping about. Everything was lush and verdant - like an image from a dream that is now very firmly etched onto my memory. I picked a couple of wild flowers for my girlfriend and was almost overwhelmed by a real feeling of achievement. This was undoubtedly my most ambitious and enjoyable mountain experience ever. I enjoyed the great company of the other five lads in the group and in Paddy we were fortunate to be guided by someone who knows the ridge so well. I felt constantly tested by the terrain and the fairly long, successive days climbing pushed my endurance. But everything went perfectly to plan and Paddy’s expert guiding gave all of us in the group huge confidence. I couldn’t have wished for a better week. Glad you enyoyed your days in Skye, you certainly increased your Munro tally quite a bit and getting the hardest done first everything else will be a doddle. What a fantastic adventure not to mention achievement! Your photos are superb - I especially love the B&W ones.